Beachwood football players came off the field at the Sept. 21 game against Perry and reported that Perry players were using slurs on the field, particularly the n-word. They later also reported that the officials were well within proximity to hear the slurs being used, but did not call any fouls or flags on the players. Around half-time, Beachwood Athletic Director Ryan Peters was called down to the field and briefed on the situation. He spoke to Coach Damion Creel and several players who confirmed the use of slurs and identified one player in particular as a repeat perpetrator. In response, Peters and Principal Tony Srithai met with the Perry administrators who were at the game, who said they would address the issue. They also spoke with game officials, who claimed they had not heard anything, but would be on the lookout. According to Beachwood administrators, the second half of the game went smoothly after both teams had been spoken to by their respective administrators. That night and the following day, Peters, Srithai and Superintendent Dr. Robert Hardis composed a letter to the BHS community about the incidents of the game. Creel also had the opportunity to review the letter before it was sent. “We know [Beachwood] players tell the truth and that this happened,” the letter said. Administrators made a commitment to keep this issue relevant instead of brushing it aside, as may have occurred in the past. They also met with Beachwood players to get the full story. Senior captain Jacob Borison said players were appreciative of the administration’s response. Following this meeting, administrators sent a report to the Perry administration with a recap of the events from Beachwood players’ point of view, asking them to address the issue with their coaches and players. They also asked that Perry join Beachwood in fighting racism within the Chagrin Valley Conference (CVC). Additionally, the report was sent to the Ohio High School Athletic Association (OHSAA), the new CVC Commissioner, Don Lewis and OHSAA Executive Director Jerry Snodgrass. In the week following, Beachwood also hosted the Chagrin Valley Conference Positive Coaching Alliance Workshop. 440 students from CVC high schools and middle schools attended the leadership conference. One of the topics addressed was race, with two moderators leading the conversation. Peters hopes that this face-to-face interaction is one of the ways that Beachwood, as one of the more diverse schools in the conference, will be able to influence other coaches and players. Coach Creel feels strongly that his players should know how to respond in life, not just on the field. Initially, Beachwood players were emotional and angry, wanting to retaliate physically against Perry. Creel, however, says he wants them to learn to react better when they are confronted with hatred and racism in their lives. Players such as junior Letraize Walker took Creel’s words to heart. The Bison went on to have a 6-4 season, compared to 2-8 in 2017, 3-7 in 2016 and 1-9 in 2015. “Every single year [the football team has] the same issues, and it’s always the same handful of teams,” Borison said. Last year, there was an incident with Geneva similar to the one with Perry this year, according to Coach Creel and multiple players’ accounts. Geneva players reportedly called Beachwood players multiple slurs, though little to no action was taken following that game. The incident led to a fallout between Creel and the Geneva coach. They reportedly were friends before that game, but have not spoken since. This year, the officials were prepped for the tensions, and Geneva administrators were aware of the situation. Beachwood reported that Geneva players played a clean and overall good game. “That was a good team we played, I respect them,” Walker said. Creel had a different perspective on this year’s game. “[The Geneva staff were] arrogant about the situation, kind of oblivious,” Creel said. On the other hand, Creel also explained that some Perry staff showed concern following this year’s game. These issues are not new. While the school has seen an increase in diversity in the past few years, Beachwood has always had more Jewish, African American and other minority students than other high schools in the conference. As an alum and former member of the wrestling team, Peters remembers many anti-Semitic remarks being made towards him, his teammates or other Beachwood athletes when he was in high school. Creel, also an alum of Beachwood and its football program, also has memories of experiences with racism on and off the field. Creel also recalled a specific incident from his time on the Beachwood football team targeting Dawann Gray, Sr. father of current junior football player Dawann Gray, Jr.
At the time, Creel explained, the team was made up of mostly African American students and the majority of the white players were Jewish. They played, as we do today, many teams that did not have many minority students in their schools, let alone on their football teams. During a game against Parma, whose team did not have any African American players according to Creel’s memory, their run-through had been painted with an image of Gray being hanged. Gray did not respond to a request for comment about the incident. The Ohio High School Athletic Association is the governing body of high school sports in Ohio, and, according to Tim Stried, OHSAA Director of Communications, the organization depends on school administrators to deal out consequences for offenses committed by students. However, he did not respond for comment when asked if the OHSAA has ever sanctioned teams for racist remarks or actions on the field. Stried explained that sanctions or suspensions would only be considered for racist remarks on the field if the actions of that team or player were “extremely racist” and if it could be proven. But he did not respond for comment when asked who would make the determination. OHSAA does sanction teams and school districts for violating policies. For example, on Oct. 8 it was announced that the Cleveland Metropolitan School District was sanctioned for incorrectly assigning students to certain schools for athletic participation. The district was fined $5,000 by the OHSAA for this offense. Additionally, 19 Beachwood players were suspended for one game following their game against Harvey High School on Oct. 12, during which a Harvey player tackled a Beachwood player after a play had ended and a brawl broke out. The players suspended had left the bench area to pull Beachwood players away from the fight, and leaving the bench to join a fight violates OHSAA rules, which was the reason for the suspension. But when it comes to racist actions, it is difficult to see who perpetrators may be from a tape of the game, as Bison TV crews found in their own research as they reviewed the game tape. To what level must it be proven, though? The report from Beachwood Administrators was corroborated officially by four players. Is this enough for the OHSAA to take action, or would denial from Perry players take away any credibility on Beachwood’s behalf? According to Streid, the OHSAA would ideally conduct their own investigation into these matters and hold teams, players and coaches to a high standard of sportsmanlike conduct, but they simply do not have enough staff to do so. However, he did not respond for comment when asked what the punishment for these incidents would look like, and if or how the OHSAA would investigate and decide punishment in these cases. As a school that has been the target of these behaviors, Beachwood administrators are eager to work with other administrations to eliminate this experience from athletes’ lives. Peters personally wants to work on a local and state level to better educate districts instead of isolating them from one another, in addition to working within the Chagrin Valley Conference. With regards to the Perry administration, Superintendent Jack Thompson, Principal Todd Porcello, Athletic Director TJ Rockwell and Coach Matt Rosati have thus far not responded for comment. Peters and Creel say they hope Perry will stay true to their word and take care of the issue internally. These issues cannot be tackled if there is not a standard by which officials are told to call players for using slurs on the field. However; unless the officials hear it said, there’s also very little they can do. According to the OHSAA, they are legally very limited when taking action against unsportsmanlike conduct if there are no witnesses, so officials are expected to call players on this behavior, whether verbally or with a foul or flag on a given play. A single athlete’s testimony is not enough to bring consequences on a team whose actions may be unsportsmanlike or prejudiced, so officials must look out for it or there can never be change. However, Beachwood players did not feel that officials took the issue seriously during the Perry game. “When we were telling [the officials what happened], they didn’t care,” Walker said. 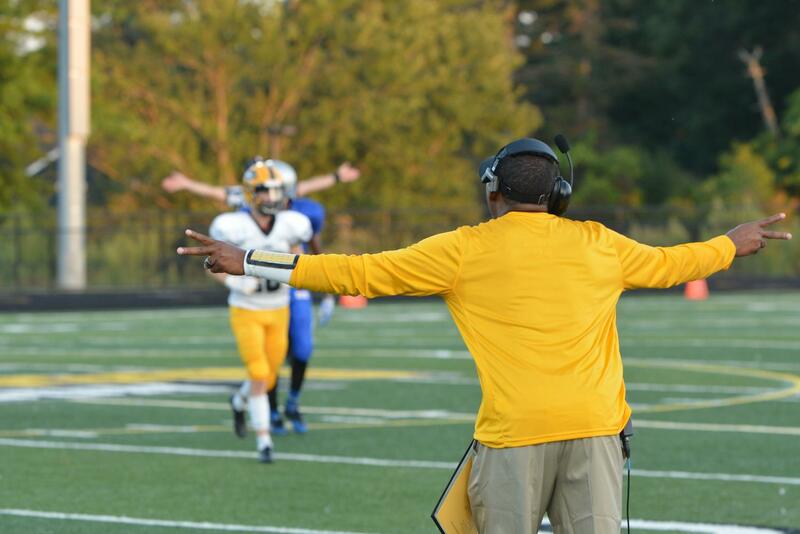 The following week, Beachwood administrators spoke with the officials for the game against Geneva to inform them of the heightened sensitivity to racially charged comments and to ask them to be attentive to the issue. According to Borison, the team noticed the difference. This is not an issue that can be resolved quickly. Trying to get into the head of your opponent through trash talk is prevalent in the lives of athletes, but because of its common place on the field, players can become desensitized to profane and offensive comments such as slurs. Multiple players were surprised to learn that the Beachcomber was pursuing this story. They were angry and hurt by the comments, but saw it as something they simply needed to move past. This is the danger of allowing hate speech on our fields, in our sports and in our schools. It creates a highly-politicized environment, but it is also a toxic one. Studies show that it is also threatening to the physical and mental well-being of minority students. Especially in the Beachwood community, where students who are not a member of at least one minority group are few and far between, district leaders feel that they can no longer afford to sit idly by and allow this type of experience of prejudice to occur in so many students’ lives. Undoubtedly, Perry students and faculty have a different perspective on this issue and on the specific incidents in September. While the Beachcomber has had open conversation and interaction with Beachwood staff and players, Perry staff has not been responsive. The Beachcomber tried to reach multiple members of the Perry administration and staff, including Coach Matt Rosati, Athletic Director TJ Rockwell, Principal Todd Porcello, and Superintendent Jack Thompson. None of them responded. However, when a Bison TV reporter reached out to Rosati, he initially agreed to an interview. He later cancelled, sharing that it had been their athletic director’s instruction to do so. This already unclear story becomes infinitely murkier when one side refuses to come to the table. There is so much information that is unavailable because of Perry’s lack of communication: Were there consequences for the perpetrators on Perry’s team? Has Coach Rosati’s tactics of speaking with his players changed at all as a result of this game? Have any minority students attempted to start conversations about race relations within the Perry community? Until the Perry Administration is willing to speak freely about issues within their community, the Beachcomber will not be able to answer these questions. Racism is and always be a hypersensitive issue. I’ll never know what it’s like personally. Did you interview the four players claiming they heard slurs? Did you interview the officials to see what they heard. Yet you take the word of a high school students opinion. “The officials didn’t care?” I more than doubt that as I know one of the officials. You were irresponsively unfair. But….a couple high school kids opinions fit your agenda rather than good reporting. Life goes on….